Capping a season filled with suspicion and success, the San Francisco Giants left fielder became the oldest player to become the MVP of a major North American professional league. The 40-year-old received 24 of 32 first-place votes and 407 points Monday in balloting by the Baseball Writers’ Association of America to earn the award for the fourth straight season. 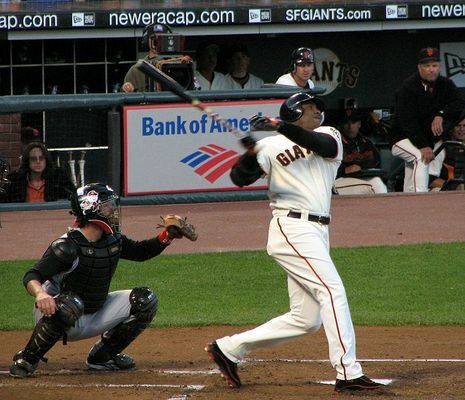 Bonds' accomplishments during his baseball career place him among the greatest baseball players of all-time. He has a record-setting seven Most Valuable Player awards, including a record-setting four consecutive MVPs. He is a fourteen-time All-Star and eight-time Gold Glove-winner. He holds numerous Major League Baseball records, including the all-time Major League Baseball home run record with 762 and the single-season Major League record for home runs with 73 (set in 2001), and is also the all-time career leader in both walks (2,558) and intentional walks (688).